Sheriff Bowling informed the Club members that Creek County covers 792 square miles, has a population of 72,000, and 35,000 of it is in unincorporated areas, for which the Sheriff’s office is responsible. “When you spread that out, that’s pretty vast area.” Between calls, patrols, and transport, deputies drive 61,000 miles a month. Some transports might be out of state. Each officer drives approximately 300 miles per shift. There are 89 employees including 37 commissioned deputies, 18 deputies in the field, the rest are at the jail, transport, Courthouse security, and a civil deputy, and administration. The Sheriff went on to say the department has four investigators and 9 dispatchers. There are dispatch offices in Sapulpa, Bristow, Drumright, and Sapulpa. “We’re only one of two agencies that have a double console P25. It’s the new generation radio system. We were actually the first agency besides OHP to get the P25. Bowling then explained the Creek County Sheriff’s Office budget. “The juvenile center costs about right now $1 Million per year to operate. It was a lot higher than that. We brought some of it down, we’ve had to reduce some staff.” One complexity of the juvenile center is that the CCSO is required to adhere to OJA (Oklahoma Juvenile Affairs) standards. “We have to adhere to their rules, which are very strict, yet we get no OJA funding.” The juvenile center operates from the 1/6 cent sales tax. “The jail’s budget is $2.765 million per year. The costs continue to go up.” The State Department of Corrections only pays the County $47 a day to house a state inmate but it costs the county $31 a day to incarcerate that same inmate. Bowling lamented that 28 hours did not sound like a lot of hours, but that training, coupled with the officers’ regular duties cuts into their time and it is expensive. The CCSO now has a CLEET certified firearms instructor. 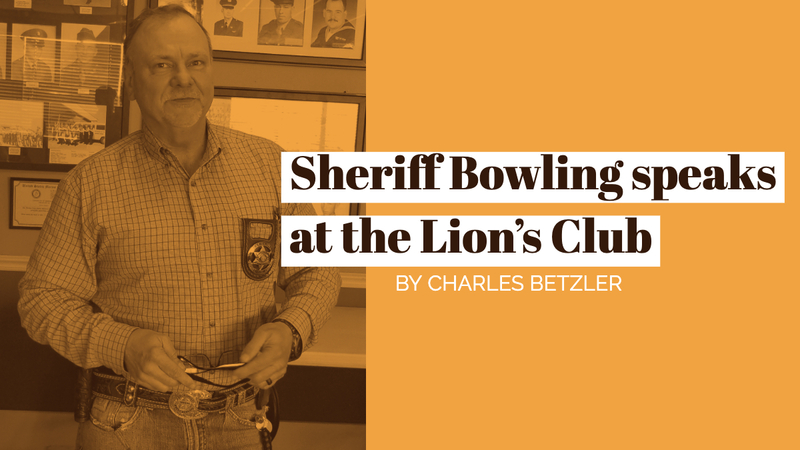 Bowling listed some milestones in the Sheriff’s office. The first is an app called GeoSafe that can be either on a cellphone or pc inside the car. It is a GPS tracking program. It allows the dispatcher to know where all the deputies are at any given time. Besides enhancing the officers’ safety, it allows for a more efficient utilization of officers in the field when responding to a call. The CCSO offers this program free to other county agencies including Keifer, Kellyville, Kellyville Fire Department, Emergency Management, Wildlife, and soon, Creek County Ambulance. The accuracy and resolution of this app is phenomenal. The Sheriff had his cell phone on him while mowing his yard, and the dispatcher could even see the mowing pattern. The jail now has phone kiosks where the inmates can go online to video chat with their relatives. These kiosks mean less movement of prisoners to make a call. There are two canines (K9) now, one is for detection, and the other is for locate and rescue. The new dog’s name is Ranger. His name was chosen in a contest by elementary students. When Bowling took office the fleet was in bad shape and many of the cars had hundreds of thousands of miles on them. He has purchased 27 cars since he took office. The officers have new uniforms that are LAPD blue. They have reduced cost by 40 percent. The outer carriers allow more equipment. The deputies carry Medpacs, tourniquets, and Narcan. The deputies have saved two lives so far with Narcan and at least one life has been saved using a tourniquet.